Softened Drinking Water - Why? Softened drinking water was promoted as "better" until the 1970s when studies showed a statistical difference between heart attacks in hard water areas when compared with naturally soft water areas. The World Health Organisation (WHO) publish the "bible" of drinking water quality and the European Commission publish directives based on what they say. The British Government enact the directive as our drinking water regulations. The current WHO Guidelines for Drinking Water Quality state that the hardness of water is not significant and no health-based guideline is given. In other words, there is no perceived risk. The Guidelines also state that sodium is not significant and no health-based guideline is given. In other words, there is no perceived risk. But, in the UK, some authorities think that salt is killing us all. So the UK government added a little proviso to the drinking water regulations saying that if the drinking water contained over 200ppm of sodium it should not be drunk by the immunocompromised or used to mix baby feeds. So, according to the regulations, softened water is safe to drink for everyone, including babies, provided the sodium content remains below 200ppm. This is the case in the vast majority of the UK. It is only when the hardness level of the mains water exceeds 400ppm that the softened water will exceed 200ppm of sodium and should not be used for baby feeds. However, even at this level of sodium, it is OK for the population at large according to the regulations. The UK is the only country in Europe to have this regulation about sodium. Meanwhile, studies go on and the latest development is a new project by WHO to give guidance to countries that use desalination equipment to provide drinking water to large communities. Having taken out all the minerals should you put some back in? And if so, which ones and how much of them? Millions of people have been drinking softened water since the 1920s and there have been no reported health related problems. The studies are contradictory, confusing, and marginal. The health risk, if any, is small. If it is magnesium then if you live in Cornwall or Scotland you would have a problem. And Cornwall has the longest life expectancy for women in the UK! Most people prefer the taste of hard drinking water. Many people prefer the taste of tea and coffee or squash made with softened water. A separate hard water drinking tap is recommended as standard to provide unsoftened water. This is typically done with a tap installed at the kitchen sink and tee'd into the pipe before the water softener. There is no legal requirement but a separate hard water tap is recommended by all of the governing bodies. We recommend the installation of a separate hard water drinking tap so that customers have a choice. Water hardness can be measured and is normally expressed in parts per million (ppm) or milligrams per litre (mg/l). Installing a water softener is like most plumbing jobs: it can be very easy, or extremely difficult! A water softener is plumbed into the incoming or rising main from where it will soften the water. Hard water drinking taps and outside garden taps are tee’d off before the water softener bypass. This diagram shows the basic connections that need to be made. 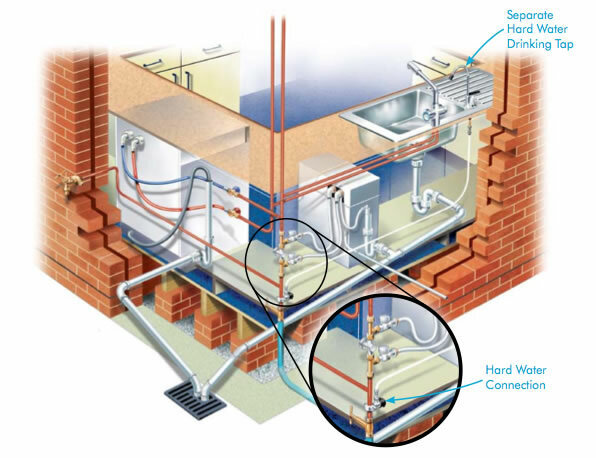 There are four connections: the inlet, outlet, drain and overflow. Hard water travels from the inlet to the softener and the softened water is returned to the outlet. From there it will feed the rest of the house. Periodically the softener will regenerate itself. 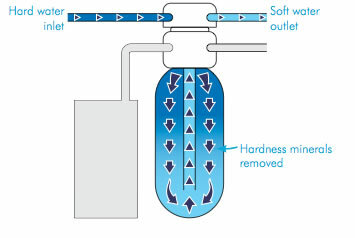 During the regeneration cycle, drain water is discharged from the softener via the drain tube to a suitable waste connection (Air Break). The overflow is there just in case anything should go wrong. In 60% of cases the rising main is in the kitchen and putting in a drinking water tap is simple. Sometimes the main is yards from the kitchen sink and this is where it gets a little involved. Standard 3/8" flexible tube is much easier to run than 15mm copper. It is quick to run under units and doesn't look too bad when it has to be on show. The bore is sufficient to supply a good flow rate to the drinking water tap even if the pressure is low. There are two options available: tube with a hytrel lining makes sure that no taste leaches into the water. The unlined tube is a lot better value (per foot) and there are normally no problems with it. The only downside is that it is not as flexible as the lined tube. We recommend using 3/8" tube as standard because it gives a good flow rate; however, when it is in view the 1/4" tube is a littleeasier to hide - particularly around door frames and along skirting boards. The 1/4" gives an adequate flow rate but you really need at least 3 bar. People will generally start to complain when the flow rate drops below 2 l/min. For (lack of) visibility, even better than the 1/4" tube is 3mm tube. It can almost be made to disappear. 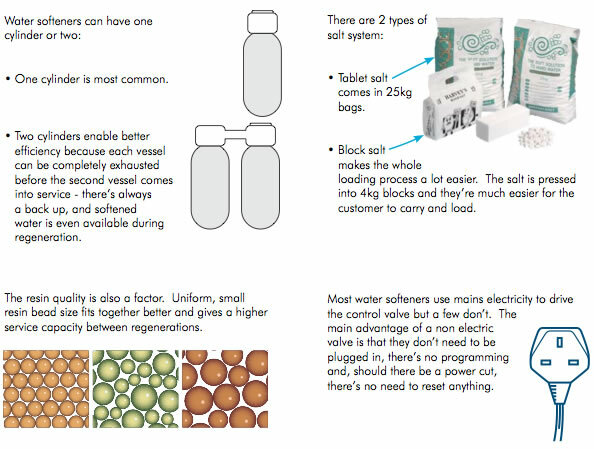 This simple to use flow chart makes it easier when deciding which size water softener to use. Indirect systems with a loft storage tank rarely have a flow problem. The only real reason for installing a 1" softener is capacity, i.e. when the softener can't otherwise regenerate fast enough for the demand. Direct systems need a high flow rate and when the house has more than 2 bathrooms a 3/4" water softener may suffer. Low pressure or 3 storey houses can also suffer. Even if the rising main is less than 1" (28mm) the 1" softener can still be a better choice because it will give less pressure drop. What flow rate do the water board have to provide? 9 l/min! That's about enough to run a kitchen sink tap and fill the storage tank in the loft. It isn't enough to run more than two bathrooms on a direct system, and it isn't really enough to run one! As any plumber knows there are 101 if's, but's and maybe's. There may be a kink in a pipe, there maybe an 80 l/min power shower, the customer may have a compulsive washing disorder, it might be a Tuesday. If in doubt, remember - bigger is better! 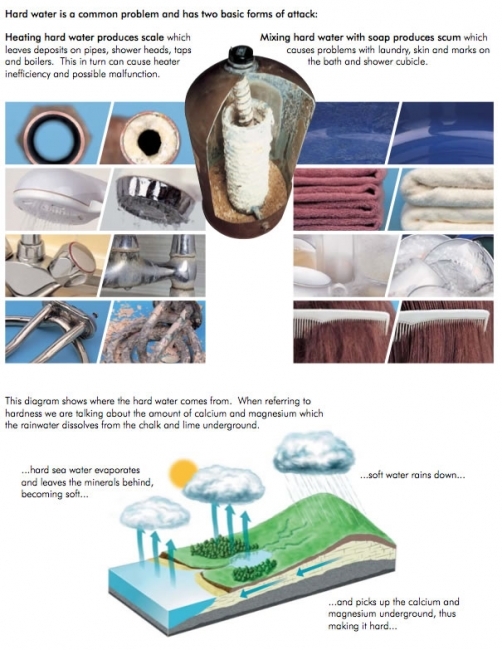 Although water softeners work on the same principle they differ in many ways. There are two different types of control valve: timer controlled and meter controlled. Timer controlled valves have a timer that initiates the regeneration at preset intervals based on expected water usage. Usually every two or three days (regardless of actual water usage). Meter controlled valves measure the service water intake to determine more accurately when they need to regenerate. If the homeowner goes on holiday and doesn’t use water, the softener will know and postpone the regeneration, saving salt and water. Water softeners work by ion exchange. Although they differ in design they share the basic characteristics. The brine tank contains salt, the pressure vessel contains the ion exchange resin and the control valve. The inlet, outlet and drain are shown in the following diagrams, but not the overflow. During the service cycle, hard water enters the control valve and descends through the resin bed where the hardness minerals are removed. The soft water then travels up the central tube and out to feed the house. The regeneration cycle is initiated by the control valve. 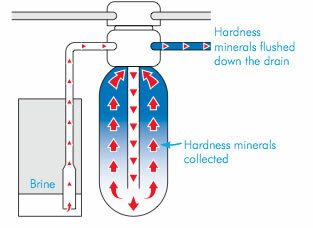 Salt water (brine) is sucked in by the control valve, goes down the central tube and backflushes up through the resin, removing the hardness minerals en route, and is then flushed down the drain.